If you’ve ever wandered the UNESCO World Heritage-listed canal rings of Amsterdam, you’ve noticed the many houseboats moored along the canals. Have you ever wondered what they’re like on the inside? What’s it like to live in a houseboat? 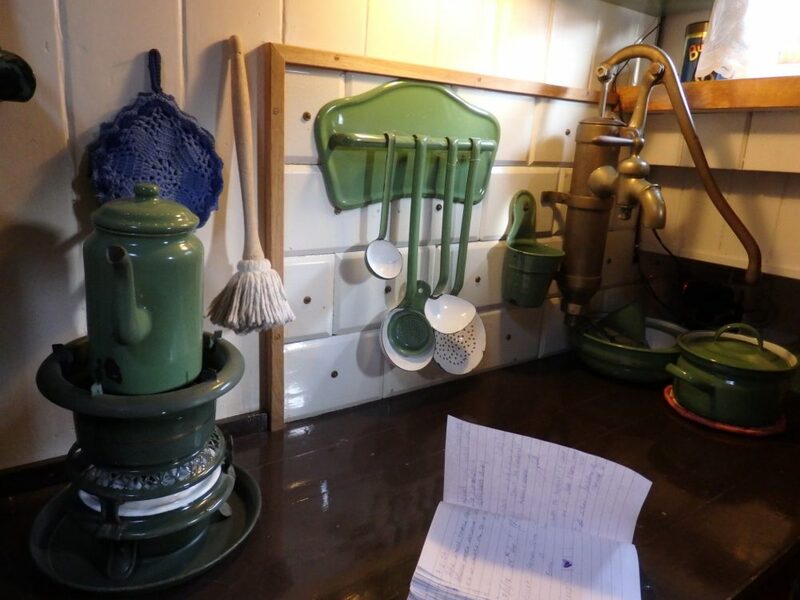 The Houseboat Museum gives a glimpse of that life: a very quick glimpse, given how small a vintage houseboat is. My daughter and I spent about 20 minutes to see the whole thing. Like many houseboats around the Netherlands, this one, the Hendrika Maria, is a re-purposed cargo sailboat, originally used to transport things like lumber and gravel through the Dutch canals network. These typical boats are very shallow draft, meaning that the water doesn’t have to be deep to accommodate them. The Hendrika Maria only extends about a half a meter below the waterline. The Hendrika Maria was built in 1914 and worked as a cargo boat until 1967, when it was converted to an 80-square-meter houseboat. Before that conversion, the family lived only in the very small space at the stern (rear) of the boat. That section was restored to its original state in 2008. Instead of a keel or centerboard, canal sailboats have leeboards on both sides. The leeboards are lowered or raised as needed to keep the boat on course. Nowadays, as houseboats, it’s very rare for these vessels to actually move. Some don’t even have motors or sails anymore. They stay moored in one spot along a canal: a mooring leased from the city. They have hookups for plumbing, sewage and electricity, so they can be as comfortable as a house on land. Stepping down a short stairway from the deck, we (my daughter and I) first arrived in a tiny room, the restored deckhouse. 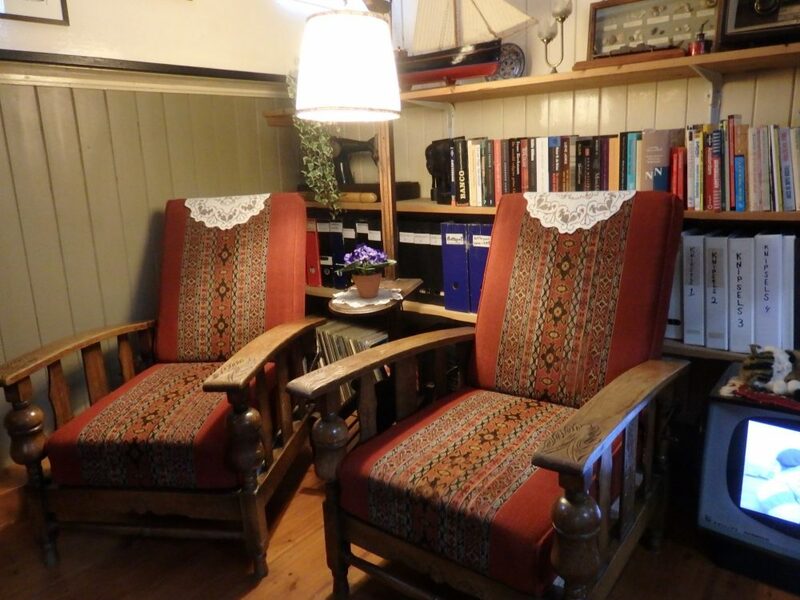 In the boat’s cargo shipping days, this tiny room – I’d guess about 4 square meters – served as the kitchen, living room and bedroom for the captain and his family. A tiny “hallway,” perhaps a meter high, extends from the kitchen space into the stern of the boat. Two beds, built into the sides of that hallway, would have been incredibly cosy – or incredibly claustrophobic. 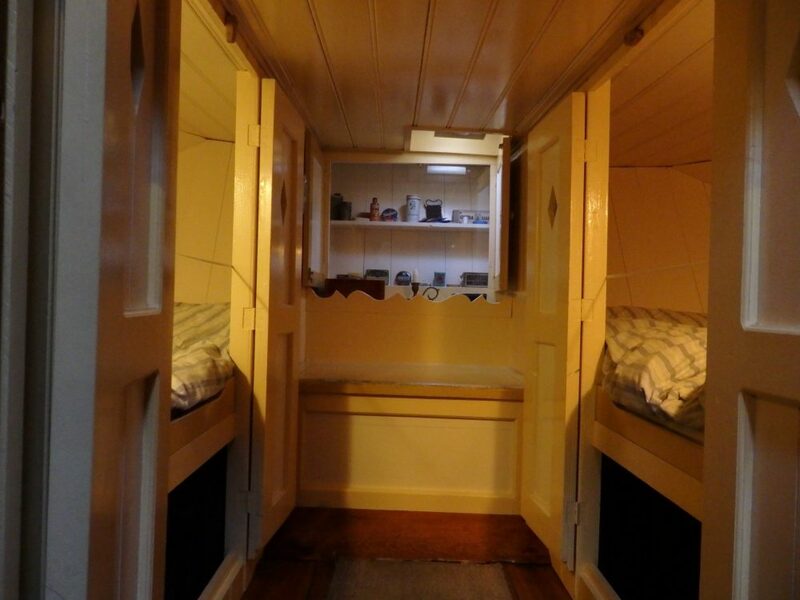 A family of four could sleep in these “cupboard beds,” the parents on one side and the children on the other. We had to kneel to the ground to enter the little hallway. The cupboard beds in the Houseboat Museum. It looks like a normal hallway, doesn’t it? That ceiling is about a meter high, I’d guess. The next room is the reception area and shop for the museum, so my sense of experiencing the houseboat way of life disappeared for a moment. After the conversion to houseboat, this space, once part of the cargo hold, served as a good-sized kitchen. Passing through reception, we entered the living room of the post-conversion houseboat. Surprisingly roomy, it felt homey and comfortable. During the boat’s conversion, a new roof was added to what was originally cargo space. Its long, narrow strips of glass work as skylights. Those, combined with the small square windows along the walls near the ceiling, provided what seemed like adequate light on this grey day. The next room holds a double bed, but the rest of the space is filled with displays explaining this particular boat’s history. Moving further toward the bow (the front of the boat), we saw a small, very low-ceilinged space for viewing a film about the houseboat. From there we could peer through a window into the unfinished storage space in the bow, with one more cabinet bed visible. What surprised me most was one wall that included some listings of houseboats for sale in Amsterdam. The prices struck me as outrageous for the small amount of living space they include: upward of €350,000. I asked the woman at the museum’s reception about this. She told me that the prices include the permit on the mooring. 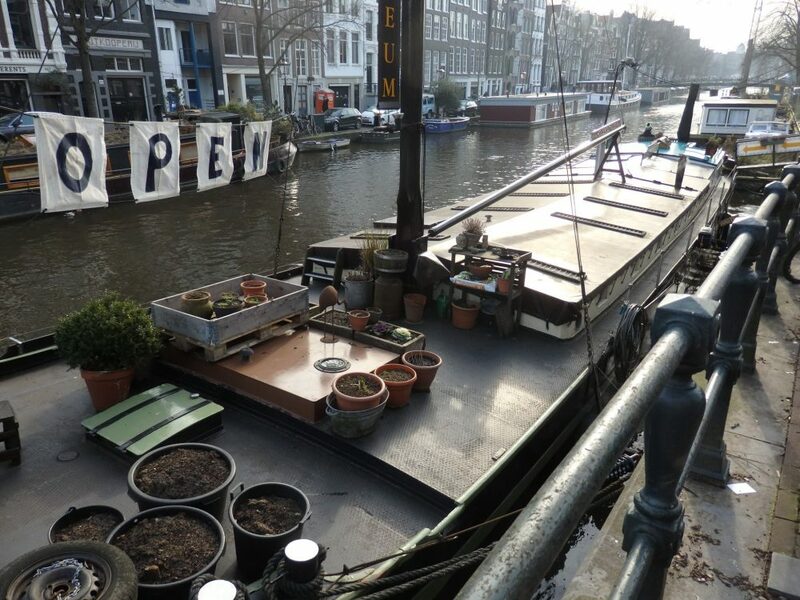 There are no empty moorings available in Amsterdam, and none likely to be added, so while the boat itself might not be worth more than about €150,000, she said, the price is so much higher because of the permit. For comparison’s sake, here in Groningen, where I live, houseboats are considerably cheaper, less than half the price in Amsterdam. Here, the mooring often also includes a small strip of land along the canal, so some houseboats have, in effect, yards. Groningen is a university city, and many students rent rooms in houseboats. Often poorly maintained, they have a reputation for being cold and dark. 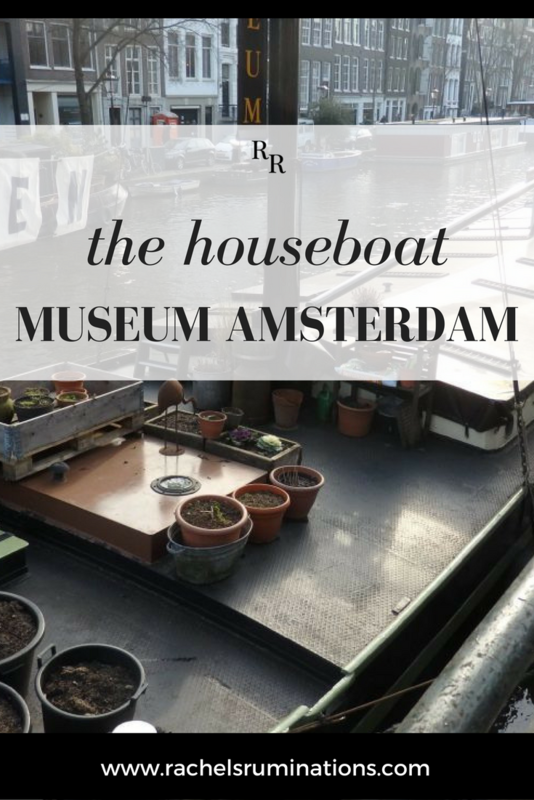 In Amsterdam, with its expensive housing markets, houseboats are a desireable alternative and, like the Houseboat Museum, many have been upgraded and insulated so that they become an attractive place to live in a central location. If you’ve admired houseboats from the outside and wondered about the inside, the Houseboat Museum is worth a stop. Don’t plan a lot of time, though; it’s tiny and, if it’s crowded, a bit claustrophobic. Disclosure: I received free admission to the museum, but paid for my daughter’s admission. All opinions, as always, are my own. Have you ever thought about living in a houseboat? Add a comment below! This museum just went on my must-see list if we ever get back to Holland. Thanks for the great description. I probably couldn’t live on a houseboat full time, but would love to spend a week or so vacationing on one. Though I haven’t checked, there are very likely hotel houseboats or Airbnb accommodations on houseboats. This one is about 80 square meters, which is a good size for two people.